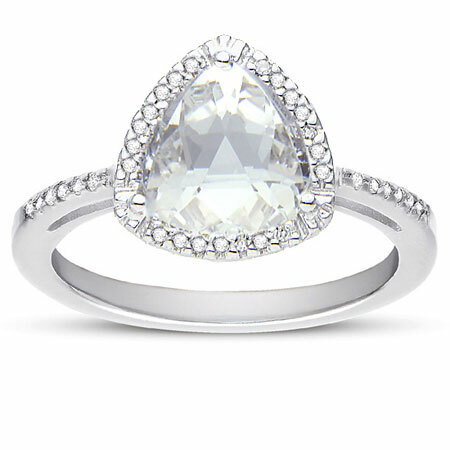 Stunningly unique and amazingly cute with its white topaz and diamond halo, this ring is fascinating and an elegant fashion item for any classy lady. Immediately noticeable with its classy 925 sterling silver frame, it is difficult not to get carried away with the stylishly embedded 0.15 Carat diamonds all on its upper parts. Affixed atop the ring is a triangular sterling silver base which also holds the 1.65 Carat, white topaz gemstone with its checkerboard triangle frame. Added to this spectacular 9mm x 9mm gemstone are 0.15 Carat diamonds all around it for that sizzling halo effect caused by the entire 37 diamonds which adorn the ring. We guarantee our Checkerboard Triangle White Topaz and Diamond Ring, Sterling Silver to be high quality, authentic jewelry, as described above.